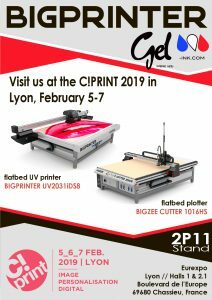 Visit us at the C!PRINT 2019 in Lyon (France), February 5-7. This show is one of the most famous signage exhibitions in France. C!PRINT will gather over 250 exhibitors who are manufacturers, distributors and service providers in digital printing solutions, marking, textile printing, signboard, cutting solutions, finishing solutions and printing media. On the program: a three day meeting full of innovation, experimentation and inspiration with the markets’ leaders. A flatbed UV printer BIGPRINTER BIGJET 2031iPM8 and flatbed plotter BIGZEE CUTTER 1016HS will be presented at the booth of our dealer GEL INK in France. You find us at the booth 2P11.